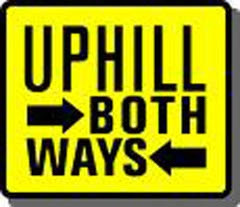 You can actually go uphill both ways. As in: “When I was your age, I had to walk to school ten miles away. I had to dodge lava and dinosaurs. And it was uphill both ways.” There it is! “Uphill both ways.” This is always tacked on to the end of a “you don’t know how good you have it” lesson to make a point. Everybody knows that you can’t go uphill both ways, right? Picture this. There is a hill. Your house is on this hill. It is a small hill and only your house fits on the top of it. Any way you go from the house it is downhill. Then picture a mile (or ten, and don’t forget the lava and dinosaurs) away, another, similar hill. On top of that hill is another house, similar to your own. Now pretend you are walking from your house on top of your hill, past the lava and the dinosaurs, and start walking up the hill to the other house. Now play and have fun. It’s late now, and you need to go home to have dinner. Walk down the hill from the house you are at now to the dinosaurs. They are sleeping because it is late, but don’t forget about the lava, it never sleeps. Finally, you reach your own house on it’s hill. You have to walk up the hill to get in, right. So you walked uphill both ways! TA DA!